.. Northern Cross Trailers ..
Tahun 2010 dan Sekali lagi Ramadhan menjengah dan Syawal bakal menjelma. Itulah dunia sekarang, setahun seperti dirasakan sebulan, sebulan seperti dirasakan seminggu dsb. Itulah rasanya apabila kita terlalu sibuk dengan perkara dunia sehingga waktu berlalu terlalu pantas tetapi perlu diingat sbagai hamba Allah kita perlu sentiasa memohon kemaafan dari Nya dan juga kepada sesama manusia yang hidup dan yang telah meniggalkan kita. Waktu yang selalu diambil oleh kebanyakan umat Islam adalah apabila tiba Hari Raya Aidilfitri dimana semua orang bergembira setelah berjaya menunaikan ibadah puasa selama sebulan. Kejayaan ini boleh ditaksirkan sebagai kemenangan didalam peperangan kecil didalam diri kita dalam menentang hawa nafsu masing-masing. Tahniah buat semua yang berjaya, bagi yang kurang berjaya pula janganlah patah semangat. Selagi Allah memanjangkan usia kita, InsyaAllah akan ada ruang untuk memperbetulkan dan menambahbaik keadaan. Kepada semua, bagi mewakili rakan NXTeam yang lain, kami ingin memohon seribu kemaafan kepada semua sekiranya perilaku atau tuturkata kami ada menyinggung mana-mana pihak. Sesungguhnya sekiranya itu berlaku ianya adalah diluar kesedaran kami. Harapan kami agar semua bergembira disamping keluarga, rakan-rakan handai , sanak saudara etc. 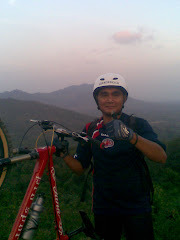 We welcome any suggestions from all of you in objective to improve mountainbiking scene here in Malaysia generally and Perlis specifically. 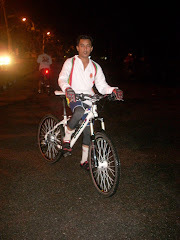 As we can see nowadays the public has started to realize the importance of exercising and one of the way is cycling. It doesn't matter if it is road cycling or off road cycling as long as we give a hard time to our heart and let the sweat flows from our body. So, don't stop cycling and let us make this scene as big as ever. Cheers! You Ride , We Support! Merdeka ...... Merdeka ...... Merdeka ...!!! NASI LEMAK BUAH BIDARA, SAYANG UNCLE THOMPSON HAMBA LAYANNN!!!! Setting Your MTB for Race! 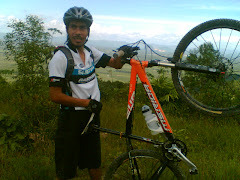 Setting/Preparing you MTB for race. Let's Try This At Home. Remove any additional accessories from your bike including racks, reflectors, mirrors, bells or lights (leave lights on if you'll be racing at night). Inspect the frame, fork and all components on the bike for cracks or other signs of trouble. Repair or replace any obvious problems. Set your saddle height by placing your heel on your pedal (in your riding shoes) and raising the seat up so that your leg is straight on the bottom of the pedal stroke (6 o'clock position). Your seat should never be so high that your hips rock when you pedal. You may want to lower your seat if the course is very technical and has many steep downhill slopes, but you may pay for that on the uphill portions. When your seat is at the optimum height it allows you to get full leg extension and full use of your leg muscles. Set your saddle position - start by having it level with the ground and try it that way for a little while. If you are putting too much weight on your hands, raise the saddle's nose by a degree or two. If the nose is uncomfortable and you experience any numbness, lower the nose a degree or two. It may take a while to find the perfect saddle position for you. Set your saddle's fore/aft position by adjusting it so that when your are seated and have your pedals in the 3 o'clock and 9 o'clock positions, your forward pedal spindle is in line with the small bump just below your kneecap. Position your handlebars so that they are between an inch and 2 1/2 inches below the seat. The lower they are, the more control you'll have when climbing, and higher bars give more control when descending. Look for the perfect balance of the two to find the best handlebar position for you. You can adjust your handlebar height with riser or flat bars, different stem heights, and spacers under the stem. Be sure that the ends of your handlebars are covered by the ends of the grips or are filled with plugs. Position bar ends anywhere between parallel to the ground and a 45-degree angle from this parallel. Go to the lower end of the spectrum for more performance-oriented positioning. Inflate your tires to a tire pressure that works with your weight, the tires that you are using and the course conditions. Choose clipless pedals over platform pedals with toe straps. Although clipless pedals are a bit intimidating at first, you get a better connection with the bike, and they are much easier to get in and out of than toe straps. Check to make sure that the chain is clean, lubed and not stretched. Chains stretch over time, and this will lead to bad shifting and gear slippage. Check the front and rear derailleurs to make sure that they are shifting properly and cables are in good condition. Bad shifting is not only very frustrating but can also blow the race for you. Be sure that your brake cables, pads and levers are in good condition and working well. Turn your handlebars from side to side and see whether there is any play in the headset or whether you hear any grinding noises. Disassemble, clean, grease and adjust if necessary. Check your suspension fork for smooth performance and no play in the fork legs. If your fork isn't sliding easily, refer to your owner's manual or check with a local shop for maintenance. Ride your bike after doing any adjustments or repairs. You'll want to feel comfortable and confident at the start line. i.) The best upgrade that you can make for better performance is lighter tires and wheels. The rotational weight has a huge impact on how a bike accelerates and climbs. Start with kevlar-beaded tires and then go with a nice light wheel set. You'll notice the difference on your first ride. ii·) When selecting a tire for racing, choose a tread design that works with your riding style and the course conditions. Semislick tires are great for racing, but they do take some getting used to, and they aren't for all riders and courses. iii·) Higher tire pressure gives less rolling resistance and reduces the chance of pinch flats. Lower tire pressure gives better traction. iv·) Many full-suspension bikes have different settings for the rear suspension, ranging from firm to soft. The firmest setting is usually best for cross-country racing. v·) If you're unsure of how to check or adjust anything on your bike, such as the shifting or the suspension, bring your bike to a local shop. 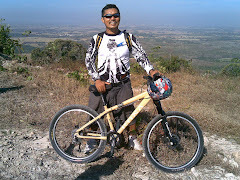 vi·) Mountain bike racing is an inherently dangerous activity that can result in serious injury or death. We recommend that you seek proper training and equipment before attempting this activity. 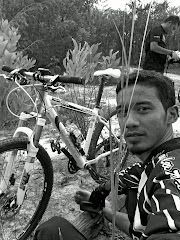 It all started when some of us got to know that we share common passion in mountain biking. Now, every weekends the team will gather and ride to various location where at the same time share our thoughts, experience, jokes and sometimes insult!! ...... hehehe!! !